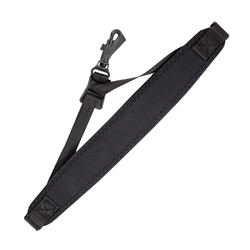 The Classic Strap offers the sophisticated performer a comfortable alternative. The tailored design is great for your saxophone, bassoon and other instruments. The 2" x 14" (5,1cm x 35,6cm) pad utilizes a laminated construction of neoprene layers, nylon reinforcement and comfort foam. These combined features conform to the neck and shoulders and create a unique cushioning feel with better support. Neotech's Classic Strap minimizes strap movement while maximizing comfort — it's sure to be a classic!